The complex combines apartments, beach front studios, junior suites, executive suites and a presidential suite. The onsite windsurf academy also includes the option to try windsurfing, kite surfing, sailing, canoes, pedaloes, and catamaran`s to hire. The Spa offers top quality therapies and treatments for relaxation and beauty. 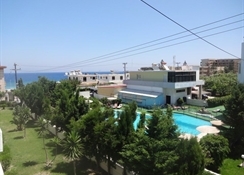 The hotel has 3 swimming pools and 2 children`s pools. There is an indoor pool in the spa centre. The hotel has a main restaurant serving breakfast, lunch and dinner, the Nautilis beach bar restaurant, a swim up pool bar and 3 other bars. 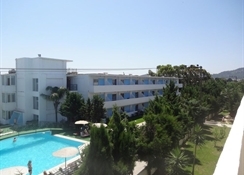 The hotel operates an All Inclusive programme which includes breakfast, lunch and dinner, all buffet style, snacks at All Inclusive bars from 10am to 6pm, ice cream (child up to 12) at the All Inclusive bars from 10am and 6pm, ll drinks (non alcoholic) and local alcoholic drinks in the Ultra All Inclusive Bars from 10am to midnight, lunch basket on request, 20 percent discount on all drinks in the Amphitheater (main bar, from 6pm to 2am), 20 percent discount in the non All Inclusive bars (Atlantis Pool Bar, Naftilos Beach Bar and Restaurant). 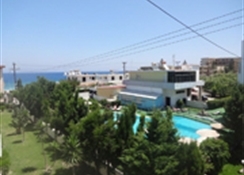 The Forum Beach Hotel will appeal to families and couples looking for beachfront accommodation in Rhodes with plenty of energetic or relaxing activities to entertain.